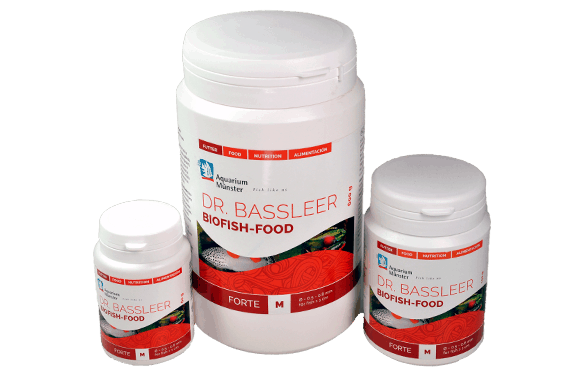 For the long-term health of your fish, we recommend a fitness treatment which consists of providing them with DR. BASSLEER BIOFISH FOOD FORTE every three to four weeks. Aside from the premium ingredients of DR. BASSLEER BIOFISH FOOD REGULAR, DR. BASSLEER BIOFISH FOOD FORTE also provides immune stimulators such as citrus fruit pulp, high-quality glucan, yeast and algae extracts. A 10-day fitness treatment with DR. BASSLEER BIOFISH FOOD FORTE is particularly helpful in stress situations such as illnesses, when moving fish or when repopulating your aquarium. DR. BASSLEER BIOFISH FOOD FORTE is offered in the different granulate sizes M, L, XL and XXL. The granulates in smaller pellet size M sink slowly, thus providing nutrients to all three water zones. This gives surface feeders, fish in the middle zone as well as bottom feeders alike a fresh and balanced diet. Ask us what fish like about us!